Product prices and availability are accurate as of 2019-04-21 08:44:57 EDT and are subject to change. Any price and availability information displayed on http://www.amazon.com/ at the time of purchase will apply to the purchase of this product. 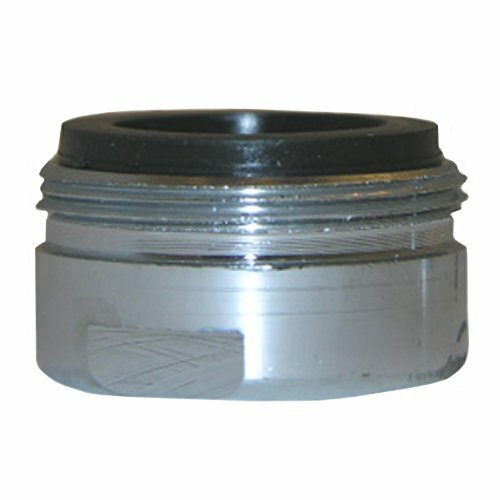 LASCO 09-1089 Deluxe Slotted Faucet Aerator with Tightening Groove, Standard 15/16-Inch Male Threads, 2.2 Gym Flow Rate At 60 Psi. Deluxe slotted 15/16-inch male aerator thread, triple screened with tightening groove. 2.2 GPM flow rate at 80 psi. Plumbers choice, "the best aerator". Lead free product, meets California AB-1953, Vermont and new federal standards for low lead applications. Chrome plated. LASCO, Lasso Supply Company Inc., The Preferred Brand! Service, Selection and Support! Larsen Supply Company is 3rd Generation, Family owned and operated for over 80 years. LASCO packaging includes helpful how to instructions and related project item information. LASCO has the largest retail plumbing line in the industry today with over 7000 packaged and 16,000 bulk SKU's. Visit our online web site catalog for one of the most complete product listing in the industry.